Have you ever seen a live search? Type something in the top bar of your browser. It shows suggestions when you are typing. This technique is called Live Search. To understand the concept first, be a live search. The user is typing in your text box. You have to get the text box's value and search for suggestions. Therefore, you have to send a request to the server to get suggestions. Then, you will get a response back from the server. You have to process the response data and show it to the user. User says, "that's not enough". Then, you have to load more result to satisfy the user. You do this each and every time user types something in your text box. That's the real way to do it. Always keep the concept in your mind until the tutorial is finished. Let's discuss how to do it programmatically with AJAX and PHP. Simply, we first send an AJAX request to a specific PHP AJAX request handler which is the live searcher. 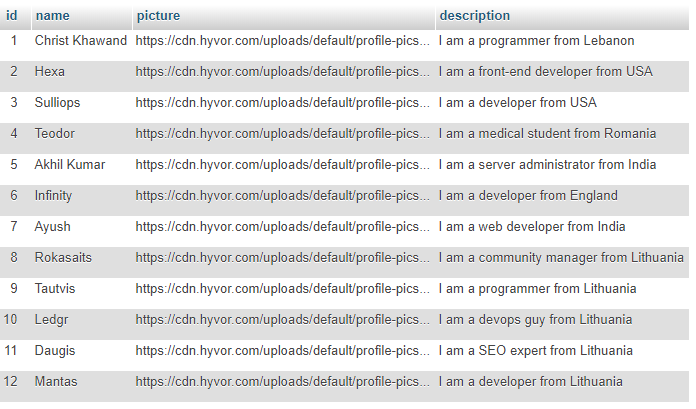 The handler connects with MYSQL database and searches for matches. Then, the live searcher sends results back. I have divided this tutorial into following subtopics. Before you start, you can download the source code or see the demo. index.html will have the search box and result container. textBox and resultContainer save DOM objects selected by the id attribute. The instance of XMLHttpRequest() will be saved in ajax. loadedUsers saves the number of users loaded and showed. This variable is useful when loading more suggestions. This anonymous function is executed when the user releases the key after pressing it. Note that onkeyup is better to use than onkeydown. Inside the function, this refers to textBox. First, it takes the value of the text box. This is the string that user has typed in. Then, it removes extra space in the beginning and end of the string. If the value is not empty, it searches for data, otherwise cleans the results container. searchForData() and clearResult() functions will be created in the next step. Here we create the searchForData() function. This function has two parameters, value and isLoadMoreMode. value is the string that user typed in. If isLoadMoreMode is set to true, the function won't clean the result. If an Ajax request is previously sent, it will be aborted because it isn't useful anymore. Then, result container is cleaned if the function is not in load more mode. When the request was successful, it tries to parse the response as JSON string. "No Users" message will be shown on a failure. Now, json variable holds an array of data. Else, showUsers() function is called passing the JSON data in. The showUsers() function converts the array of data to DOM. A row is created for each user. In a row, the name and picture of the user will be shown. The description will be shown when we click on a row. Then, load more button is appended. The searchForData() function is called in load more mode by clicking on this button. Finally, increase the number of loaded users with the length of the array. clearResult() function clears the result container. noUsers() function shows "No Users" message in the result container. Before performing a search we should have a MYSQL table with user details. Execute the following code in your MYSQL database to create a new table with four columns: id, name, picture, and description. Then, insert some random values to the table in the following way. Here you don't need to add a value to id as it is auto increment. Finally, you will have a MYSQL table like this. In this step, I will show you how to create search.php to perform search and send suggestions in JSON format. First, we have to make a connection between PHP and MYSQL. Following code does it easily. Mind to replace $host, $user, $password and $database with your database credentials. Never trust user inputs! Do a proper validation for every $_POST and $_GET variable before using them. Always use prepared statement when you have values to input into the query, as it prevents SQL injection. First, $username is changed to be search-friendly. % matches any character in MYSQL. Then, $mysqli -> prepare() opens new prepared statement. In the query, name, picture and description are selected where the name is like %username%. Here, the query is case insensitive. The strtolower() function turns $username into lowercase and lower() function in MYSQL turns name of the row into lowercase. This is a very simple way among many ways to perform a case-insensitive search. However, If you need a case-sensitive search remove both of above functions. ORDER BY statement runs a major roll in this query. It orders the result according to the best match. For example, if you search for wa, water will be before coward. $statement stores the statement instance. Then, we check whether it's false. If not, bind_param() function is called with 3 parameters: Data types, username and startFrom (OFFSET) value. Then, the statement is executed and stored. Results are bound to variables. Then, a new array is created ($array). Another new associative array which has three keys (name, picture, description) is created while looping through the result of the statement. So, full code of search.php will be like following. Let's make our live search more beautiful with CSS. Never forget to leave out a comment below. Thank you very much for reading.